Those who prefer to avoid chemicals already know that there are several natural sunscreens to choose from with which you can protect your skin. Sundicators are the perfect compliment to whatever your sunscreen preference might be. For those whose skin care inclinations lean partially or fully toward organic or all natural types of sunscreen, who also worry about their overall practicality, Sundicators Wristbands are a great measuring tool. Our easy-to-use UVA and UVB gauges monitor the remaining effectiveness of your sunscreen after application; regardless of type. In addition, they are safe-to-use with children, special needs, those with skin sensitivities, allergies or conditions such as Vitiligo or Albinism. It’s important to remember however that these work along with sunscreen and do not replace its use. As you spend more time outdoors exposed to the sun’s harmful UV rays, the efficiency level of any sunscreen, regardless of the type, will continually diminish. Add sweating, swimming and exercise to the mix and it will weaken its useful life even quicker. As it does, your Sundicator will keep track. At each stage, it will change colors to let you know at a glance when it’s time to re-apply sunscreen and, ultimately, when to seek shade or get out of the sun entirely. Our non-toxic UV monitoring wristbands accomplish this task without compromising your desire to choose a sunscreen that best fits your personal preference when it comes down to type: i.e. mineral, powder, chemical, organic, plant based, fruit based, food based, oil based, zinc based or other method of skin protection that has a certified SPF of 15 or greater. Sundicators are waterproof and strong enough to stay fully active through rain, sleet, snow or any other weather Mother Nature can dish out. They’re unisex, rugged, comfortable and work well for all outdoor sports (including extreme sports) and recreation. At about the length of a bookmark , Sundicators are extremely lightweight, TSA compliant and highly portable so they can easily be stowed in your pocket, handbag, luggage, car, stroller, wheelchair caddy, beach bag, gym bag or backpack. 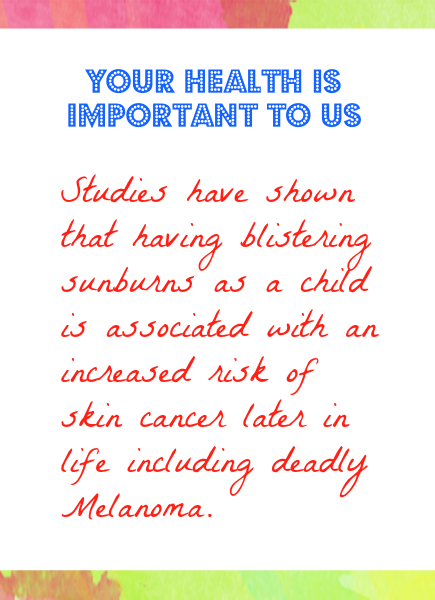 As an aside, sun skin damage doesn’t just mean skin cancer or Melanoma. On a lesser level it can (and will) contribute to premature aging and sun spots, rough surface, poor elasticity and uneven skin tone; effects that are both unsightly and permanent. None of that is worth a temporary tan that doesn’t even come close to looking as good on you as your own skin tone does, anyway. So do your best to stave-off the sun’s negative impact with plenty of sunscreen, and our Sundicators monitoring wristbands! For just under the cost of a cup of coffee per day, you can keep you, and your family safe in the sun all day. For more information, please visit our store.